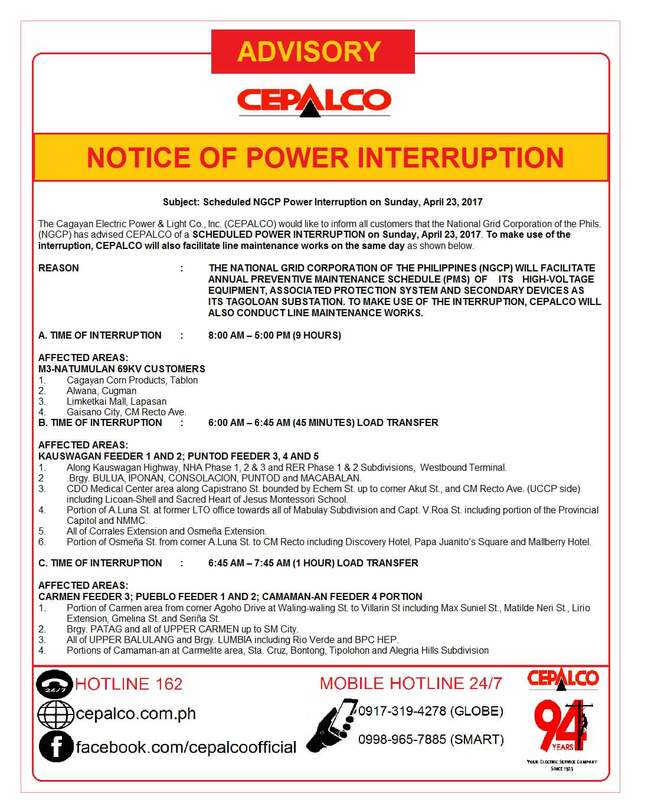 The Cagayan Electric Power & Light Co., Inc. (CEPALCO) would like to inform all customers that the National Grid Corporation of the Phils. (NGCP) has advised CEPALCO of a SCHEDULED POWER INTERRUPTION on Sunday, April 23, 2017. To make use of the interruption, CEPALCO will also facilitate line maintenance works on the same day as shown below. REASON: THE NATIONAL GRID CORPORATION OF THE PHILIPPINES (NGCP) WILL FACILITATE ANNUAL PREVENTIVE MAINTENANCE SCHEDULE (PMS) OF ITS HIGH-VOLTAGE EQUIPMENT, ASSOCIATED PROTECTION SYSTEM AND SECONDARY DEVICES AT ITS TAGOLOAN SUBSTATION. 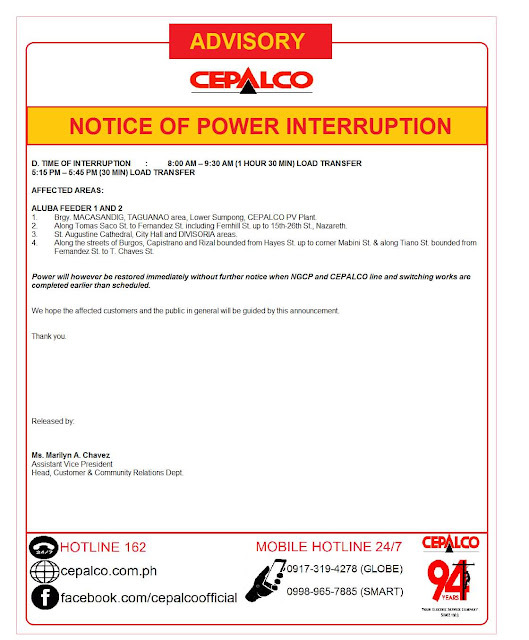 TO MAKE USE OF THE INTERRUPTION, CEPALCO WILL ALSO CONDUCT LINE MAINTENANCE WORKS. 4. Gaisano City, CM Recto Ave.
1. Along Kauswagan Highway, NHA Phase 1, 2 & 3 and RER Phase 1 & 2 Subdivisions, Westbound Terminal. 2. Brgy. BULUA, IPONAN, CONSOLACION, PUNTOD and MACABALAN. 3. CDO Medical Center area along Capistrano St. bounded by Echem St. up to corner Akut St., and CM Recto Ave. (UCCP side) including Licoan-Shell and Sacred Heart of Jesus Montessori School. 4. Portion of A.Luna St. at former LTO office towards all of Mabulay Subdivision and Capt. V.Roa St. including portion of the Provincial Capitol and NMMC. 5. All of Corrales Extension and Osmeña Extension. 6. Portion of Osmeña St. from corner A.Luna St. to CM Recto including Discovery Hotel, Papa Juanito’s Square and Mallberry Hotel. 1. Portion of Carmen area from corner Agoho Drive at Waling-waling St. to Villarin St including Max Suniel St., Matilde Neri St., Lirio Extension, Gmelina St. and Seriña St.
2. Brgy. PATAG and all of UPPER CARMEN up to SM City. 3. All of UPPER BALULANG and Brgy. LUMBIA including Rio Verde and BPC HEP. 4. Portions of Camaman-an at Carmelite area, Sta. Cruz, Bontong, Tipolohon and Alegria Hills Subdivision. 1. Brgy. MACASANDIG, TAGUANAO area, Lower Sumpong, CEPALCO PV Plant. 2. Along Tomas Saco St. to Fernandez St. including Fernhill St. up to 15th-26th St., Nazareth. 3. St. Augustine Cathedral, City Hall and DIVISORIA areas. 4. Along the streets of Burgos, Capistrano and Rizal bounded from Hayes St. up to corner Mabini St. & along Tiano St. bounded from Fernandez St. to T. Chaves St.
Power will however be restored immediately without further notice when NGCP and CEPALCO line and switching works are completed earlier than scheduled.